This from ABC News Political Unit. So all you political bloggers out there, pat yourselves on the back. You are starting to make a difference. I strongly recommend you click over. This is a small piece of their work. They rank candidates by buzz, ability to speak publicly, TV presence and many other things. I'm no beltway insider, but in the "Fire In The Belly" category, I would be very surprised if Warner really has it more than Clinton. Perhaps he's just less able to hide it. 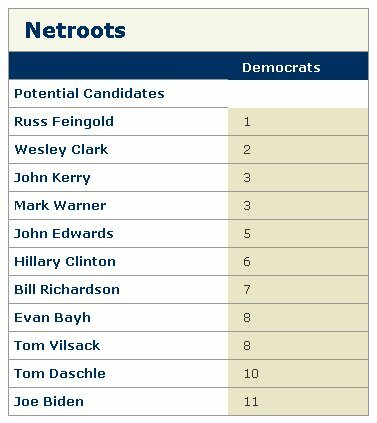 Should be interesting to see how things work out with the netroots influence because Feingold never makes it into the top five on the other charts they have. Usually he's dead last. Hey, does all this mean I have to start capitalizing "netroots"? Oh yes, I did notice the omission of Gore.